May 13 -- New Nepal Earthquake Keeps Amateur Radio Relief Effort Going. 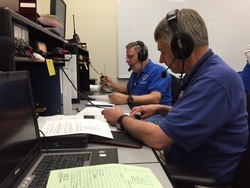 April 27-- Boston Marathon Amateur Radio Support Adjusts to a "New Normal"
The National Hurricane Center Amateur Radio station WX4NHC will conduct its annual station test on Saturday, May 30, 2015 from 9 AM to 5 PM EDT (1400Z to 2200Z). This is the station's 35th year of service at the NHC. The purpose of the event is to test the Amateur Radio station's equipment, antennas and computers prior to this year's Hurricane Season, which starts June 1 and runs through November 30. This event is good practice for operators world-wide, and familiarizes National Weather Service (NWS) staff across the country with Amateur Radio services available during times of severe weather. WX4NHC senior operators will also be performing operator training. The objective is to make brief contacts on many frequencies and modes, exchanging signal reports and basic weather data ("Sunny," or "Rain," etc.) with any station in any location. WX4NHC will be on-the-air on HF, VHF, UHF, 2 and 30 meter APRS and WinLink (wx4nhc@winlink.org) -- subject header must contain "//WL2K". Operations will be held mostly on the recognized Hurricane Watch Net frequency 14.325 MHz; operators will announce frequency changes. Amateurs can find the operation on HF by using one of the DX Spotting Networks, such as DX Summit. WX4NHC operators will also be on the VoIP Hurricane Net from 4:00 PM to 5:00 PM ET (2100Z to 2200Z): IRLP node 9219/EchoLink WX-TALK Conference node 7203. Local southern Florida area VHF and UHF repeaters will also see WX4NHC presence. QSL cards are available via WD4R. Please send your card to WD4R with a SASE. Please do not send QSLs directly to the Hurricane Center address, as they will get delayed. In preparation for hurricane season, radio amateurs in Broward County, Florida [second most populous county in the state, and 18th most populous county in the U.S.; Fort Lauderdale is the county seat] were invited by Miguel Ascarrunz, Florida Professional Emergency Manager and Director, Broward Emergency Management Division, to participate in the 2015 Broward County Hurricane Chuck Municipal Services Branch (MSB) Functional Exercise. This exercise was designed to test the communications viability between each of the municipalities' EOCs in Broward County and their respective representatives at the Broward County EOC in Plantation. Participants were tasked with testing the communication systems available to them including, but not limited to, WebEOC (an Internet-based emergency management software program), e-mail, fax, phone, mobile phones, text messaging, satellite phone and various radio communications systems including Amateur Radio, CERT radios and 800 MHz radios. high tide, resulting in a storm surge 4-9 feet above normal, which started flooding low-lying escape routes hours before landfall. The storm moved through Miami-Dade County and into Broward County by 0500 hours on April 15. Tornadoes, moderate structural damage and debris, power and cellular service compromises rounded out the scenario. ARES/RACES operators reported to the Broward County EOC to be prepared to pass traffic when other means of communications failed. During the exercise, radio amateurs passed situational awareness reports (SITREPs) as well as the Rapid Impact Assessment reports as they came in from the various municipalities. Message handlers used the ICS-213 form to send messages to and take them from the municipal representatives on the Operations floor at the Broward EOC. Pikes Peak ARES supported the 2015 Falcon 50 UltraMarathon and sister events this month. A marathon is a tough 26-mile race; a 50-mile ultra-marathon, even more so. A unique "military heavy" marathon has runners carrying 35-pound rucksacks while wearing boots and a uniform. These were the options for participants. On Saturday, May 2, 170 runners tested their mettle on the rugged terrain and high altitude of the marathon course at the United States Air Force Academy in Colorado Springs, Colorado. Of those, 125 were either ultra-marathon or military heavy marathon runners. They were not alone. Supporting them was a volunteer team of Amateur Radio operators from the Pikes Peak district ARES. Twenty-two operators, one of whom was also a participant in the marathon, set up six stations around the course to track and report runner progress, coordinate supplies and transportation, and report any emergencies on the course. This required being up and on the air before the 6 AM start time and operating past the 8 PM finish line cut off. Using radios in areas where cell phones often have spotty reception and using the same techniques that make Amateur Radio a huge asset in disasters, the ARES operators passed runner progress messages tracking each bib number as it passed through an aid station. The system used was Fldigi in the MT-63 2000L mode with Flmsg sending Incident Command System (ICS) form 213 messages over UHF/FM radios. This digital system is the same as radio amateurs might use to support Incident Commands during disasters and emergencies. The team thoroughly tested and practiced this system under the guidance of Bill Hecker, KC0ET, in the weeks prior to the event. Messages were automatically compiled into Al Glock's, KC0PRM, "Bib Track" software, originally designed to track patients during a mass casualty event. This software can even predict when a runner should arrive at the next aid station. In all, over 1070 runner position reports were passed. The hams also used voice systems for general information, coordination, weather information, and control as well as APRS to track course sweepers and give a combined operating picture. As veterans of public service events will attest, these systems become even more valuable near the end of a race as the directors try to determine who is left on the course and where they might be, and the 2015 Falcon 50 was no exception. According to Mission Coordinator Dan Martin, KD0SMP, when the race director was desperately trying to find one particular runner and was faced with possibly calling out search and rescue, the ARES team was able to show that the person of interest had never started the race and was incorrectly listed. "It's hard to describe the Race Director's reactions," Martin said. "When he saw the database evidence, you could see his relief. He knew he could get confirmation and when it came, he literally jumped for joy." Martin said "I could not be more proud to be able to say: 'No sweat, that's what we do.'" The scenario involved the touchdown of three tornadoes in Ozaukee county of EF3 to EF5 [Enhanced F Scale for Tornado Damage] severity with fatalities, severe injuries, and missing people. The communications tower at the County Justice Center was destroyed, as were the towers at Mee-Kwon Park and Belgium. One of the objectives of the exercise was to establish a communications network independent of permanent existing infrastructure. Both the Division of Emergency Management and the Wisconsin National Guard requested assistance from Ozaukee County ARES/RACES (OZARES) for the communications portion of the exercise. This request was initiated several months prior to the exercise, and OZARES was involved in the planning phases. Four communications sites were established. OZARES members staffed all sites, in addition to personnel from Emergency Management and the National Guard. The sites were located in Fredonia, Mequon, Cedarburg, and the temporary Emergency Operations Center (EOC) and National Guard base in Cedarburg Firemen's Park. An OZARES net control station was established at the temporary EOC. OZARES communications were conducted using the OZARES VHF repeater and via simplex using a cross-band repeater system based at the home of one of the OZARES members. OZARES operators were able to establish communications among all four sites using the repeater. More importantly, it was determined that communications among all sites could be successfully carried out using the cross-band repeater system. Prior to the exercise, standard simplex communications could not be established on a county-wide basis. Records of activity by OZARES members were maintained using ICS-213 and ICS-214 forms. Several other communication system links between the temporary EOC and outlying sites could not be established. In these cases, OZARES filled the gaps with reliable communications for both Emergency Management and the National Guard. Overall, the exercise went very well. Both Ozaukee County Emergency Management and the National Guard were impressed with OZARES' capabilities, cooperation and professionalism. The ARES impact to the operations was also noted by the Adjutant General and his Deputy. Points of Light is offering two free online opportunities to help organizations, agencies, and volunteers better prepare themselves to respond to disasters of any size. Nearly every disaster evokes an outpouring of individuals wanting to be involved in response and relief activities. These individuals, although well-intentioned, are rarely trained, experienced, or certified in any official disaster response function, and therefore can often add to the already overtaxed resources available to assist the impacted community. This online training will help organizations with an interest or responsibility in handling these "spontaneous" volunteers do so efficiently and effectively. To reserve a spot in this training, please register here. This exercise is intended for group interaction and should include local partners involved in the management of disaster volunteers, including EMAs and sister government agencies, VOADs, and other nonprofits. This exercise is self-paced and can be accessed between 9:00 AM and 4:00 PM ET. It lasts between 90 minutes and three hours, depending on group interaction. Note: While intended for group interaction, each participant should individually register to ensure receipt of post-exercise certificate of participation. For additional information and to register, click here. municipal EOC sites, and one operator monitored the Pennsylvania EMA (PEMA) HF frequency from home. An additional six operators checked into the net on standby in case of a real emergency. Communications and operations were conducted on two nets: A voice net for four of the EOCs, and one digital mode net for five EOCs. As part of the RACES Officer Checklist, radio contact was also established with PEMA HQ, as well as with Cumberland, Dauphin, and Lancaster County PEMA offices. Thirty messages were handled, including formal ICS-213 formatted messages. Lessons learned, according to Goodman: "At the (York) County EOC, I need to practice more on how to handle the messages coming from EOC staff and finding a better method of recording and tracking those messages." Goodman added: "Some of that requires gaining a better acquaintance with the EOC staff so we know where the incoming message traffic needs to be directed." And, "overall we had a good experience." The Adams County (Pennsylvania) Auxiliary Communications Service (ACS) was also active, participating in both the main exercise on Tuesday, April 14, and the Wednesday, April 15 shelter/decontamination portion. Adams County primarily functions as a reception county during TMI incidents. The role is mainly supporting those residents evacuating the counties closest to TMI and moving into shelters further away, and upwind, from TMI. On Tuesday evening the ACS had five operators at the county EOC to monitor traffic from PEMA HQ on VHF, HF and the primary York County VHF frequency, and pass traffic as needed. The Adams County EMA Director asked that a message be sent to PEMA HQ and a reply was received from them. This message was handled using Olivia 8/500, a data mode on 3.583 MHz; Fldigi software was used for this exchange. Having functional backup communications at the county EOC is a checklist item for FEMA and PEMA evaluators. Adams County ACS met the evaluators' requirements. On Wednesday evening, the ACS was activated by the county EMA to support the shelter/decontamination portion of the TMI exercise. ACS operators set up a station at the Red Cross shelter located at the Gettysburg High School. Two operators manned the shelter. Once the station was set up, contact was initiated and maintained with the Red Cross office in Harrisburg. The York County 146.79 MHz repeater system on Reesers Summit was employed. As in the Tuesday exercise, having backup communications available at the shelter location is a checklist item for the evaluators. Notably, the FEMA evaluator interviewed ACS operators about ACS functions and capabilities. During the final hot wash with all participants, the evaluator mentioned she was very pleased with the RACES/ACS shelter communications support. Adams County ACS met the evaluator's requirements for this segment of the exercise. The week following Dayton Hamvention will see the release of the new and updated ARES Manual. The ARES Manual and NTS Manual have together long been part of a single publication, The Public Service Communications Manual. The two manuals will now be separate publications. NTS leadership is currently reviewing and preparing to update the NTS Manual. The new ARES Manual includes several new additions - inclusion of ICS forms 213, 205, and 214 for ARES use; an expanded discussion on training resources; clarification on the role and purpose of RACES; and copies of all current ARRL MOUs. The update is the first in over two decades and was a collaborative effort of field organization leaders, federal partners, and ARRL staff. The new manual will be made available online as a downloadable PDF. I read your column (Public Service column, May 2015 QST), and noted your efforts with slingshots and fishing poles to get your wire antenna into trees. One method that really needs more promotion is the bow and arrow. I have used it many times and it is superior to the slingshot and fishing rod because it is more accurate, can reach higher, and the arrow is far less likely to get the line stuck. I have seen countless lead weights wrap themselves around limbs, and this does not happen with the arrow. The length and weight of the arrow has tremendous momentum that carries it through a tangle of small branches, all the way to the ground. I have never lost an arrow in a tree. I use an old child's toy bow made of fiberglass, labelled 25 pounds pull. It is sufficient when drawn only moderately to get over a very tall tree. I use wooden practice arrows with the tip made flatter and covered with solder for weight wrapped in electrical tape, with a rubber furniture tip on the end, to avoid harming trees or anything else. I have an inexpensive fishing reel attached to the bow below the handle with an angle bracket. The line ends in a bowline loop knot (to allow tying a string and pulling it back over the limb) and it is attached to the arrow with a small piece of masking tape near the tip and the tail of the arrow. It is important to use weak tape in case you must yank it loose to allow a stuck arrow to fall and reel in your line. It need not be a new, powerful bow. Accuracy comes from drawing it only as far as needed, not shooting the arrow in to the next county! Part of the technique is to pinch the line as it passes beyond the limb you chose, and the arrow promptly drops straight down because the forward movement is stopped. Dropping straight down means that you will have a clear line-path when you haul up, and it will not be dragging over numerous branches, far from the base of the tree. I have seen this work even with a cherry tree, which has bark of large flakes that tend to catch the line and snag it irretrievably. If the arrow does not make it all the way to the ground, some tugs will usually free it to drop lower by its own weight and pull the line over what it is dragging on. With practice, I can hit the place I want in one or two tries. I can put the line over a specific limb in about a 10 foot radius 50 feet up in a tree. It is easy to go higher.